As we age, the muscles and skin of our neck and lower face sag and lose definition forming jowls along the jaw line and a “turkey wattle” effect. Daniel Man, M.D., a Florida board-certified plastic surgeon, performs neck lifts on people living in Boca Raton, FL, and the surrounding areas to create a naturally slimmer appearance around the neck and chin area. A neck lift is designed to restore a more youthful and slimmer look to the neck and the area under the chin. The procedure is usually performed using an endoscopic device that makes small incisions through which the surgeon removes excess fat and tightens the neck muscles. In some cases, liposuction is all that is required to remove the excess fat from the neck; however, to remove loose skin, a neck lift is typically necessary to achieve the desired look. A neck lift can take years off of your appearance, restoring a youthful profile and getting rid of excess skin and fat. A neck lift can take years off your appearance, restoring a youthful profile and getting rid of excess skin and fat. If you have excess skin around the jawline, under the chin and around the neck that makes the area look wider than it is, you may want to consider a neck lift. 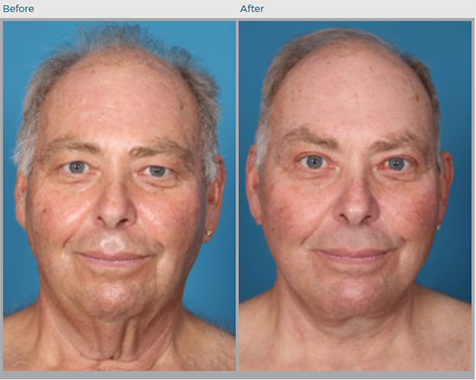 This procedure can eliminate excess skin and fat, slim the throat line, restore definition to the jawline, and give your entire neck and upper chest area a more youthful appearance. How Involved is a Neck Lift? Prior to the actual surgery, patients are given pre-op medications to be comfortable and relaxed. The anesthesiologist normally administers general anesthesia, although local anesthesia and IV sedation are sometimes used. For neck lifts involving only minimal contouring, the procedure may be accomplished with liposuction. This is effective for those with extra fat deposits and little or no loose skin and still want a slimmer, more attractive neck and jawline. If a full neck lift is recommended, the procedure is more involved. The procedure for a full neck lift requires more work. 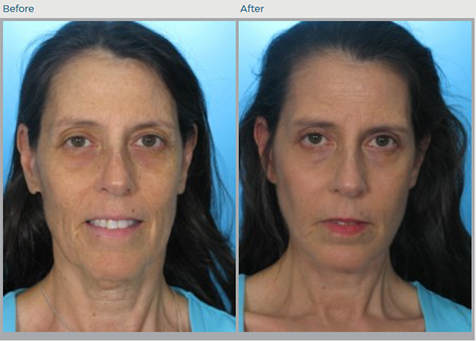 Often, a neck lift can be done at the same time as a facelift, and Dr. Man can use the technique from his natural facelift to access the upper part of the neck. A full neck lift involves tightening the platysma muscles and sewing them together to create a sling under the chin that is tight and smooth. This is done by making incisions under the chin and behind the ears. Excess skin and fat are carefully removed where indicated; the tissue and skin are repositioned, and absorbable sutures are placed to hold everything in place during healing. After that, the incisions are closed, and drains may be placed before the wounds are bandaged. Scarring is minimized as much as possible with incisions located inside or behind the ears or under the chin in the natural creases when at all possible. Most neck lift procedures will take two to four hours, depending on the amount of work being done. While many surgeons do neck lifts solely as an outpatient procedure, Dr. Man has created a center that provides patients with complete care, including the option to recover under the watchful eye of credentialed staff. After the neck lift is complete, surgical dressing is used to support and protect the neck. Safety measures during surgery include multiple monitors in the surgical suite to monitor blood pressure, heart rate, pulse, and oxygen levels. After surgery, patients are wheeled to a recovery area, where they are still closely monitored until the anesthesia wears off. Compression garments may be used to keep the neck area in place during healing and should only be removed as directed. Additionally, the caregiver is given detailed instructions about postsurgical care, including information about drains, if they have been placed; normal symptoms patients may experience; and, potential signs of complications. Over-the-counter pain relievers typically diminish and ease any discomfort. If pain becomes severe, call us immediately. Any swelling typically starts to subside after the first 36-48 hours after surgery. Bruising may take longer to fade. There may also be some drainage for the first 48 hours. There are detailed instructions for the recovery process that are important to follow to ensure a successful healing and recovery. It is common for patients to experience a tightness or even numbness in the neck area for a few weeks following the procedure. We recommend that patients sleep with their heads elevated while sleeping for at least a week following surgery to prevent further swelling. Additionally, patients must avoid strenuous athletic activities or heavy lifting for at least one month after surgery. Patients usually schedule follow-up visits three to five days following surgery and again at two weeks so that the healing process can be evaluated and stitches be removed. Following the two-week post-surgery visit, patients schedule additional follow-up appointments approximately four weeks and three months post-surgery. It is essential to maintain consistent follow-up care and check for any complications. The cost of neck lift surgery varies with each patient depending on the extent of the neck lift and whether it is combined with other procedures. During a consultation, Dr. Man goes over the costs of the procedure, in addition to the financing and payment options. We urge you to schedule a consultation with Dr. Man. This is your opportunity to get to know him and get comfortable with him while he does the same with you and your goals. He also takes time to evaluate your skin and discuss the neck lift, as well as alternatives with you. Neck lift procedures offer individuals a slimmer, more defined neck area by removing excess skin and fat that accumulate with age. For people living in and around Boca Raton, FL, Daniel Man, M.D., a Florida board-certified plastic surgeon, performs neck lifts to help them achieve a more youthful appearance. Please contact us to set up your consultation today.